Remember Drift Stage? The neon-infused '80s-style racer is back in the spotlight with a slew of new screenshots and a brief video showing off the game's time attack mode. The best part? A mid-to-late 2015 release date has been announced for the PC-bound racer, with a possible console release to follow. 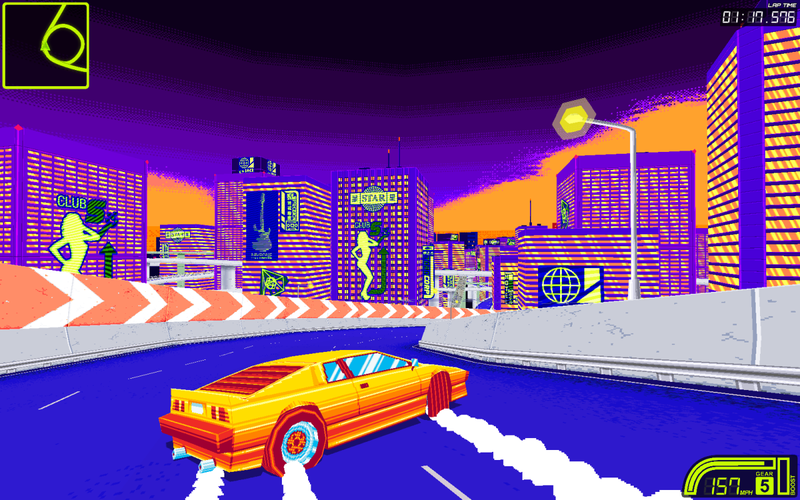 Developer Chase Petit and artist Charles Blanchard have formed their own studio, Super Systems Softworks and will be releasing Drift Stage under that label. It looks like Drift Stage has seen some improvements since we last checked in on it, judging by the pre-alpha footage below. We'll be going hands-on with Drift Stage sometime in December. When we do, expect to see plenty more on the title. Until then, just keep this video on loop, or just visit the official Drift Stage tumblr for updates.